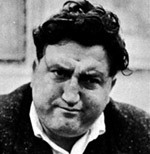 Brendan Behan was born at 14 Russell Street, Dublin on February 9th, 1923, the son of Stephen and Kathleen Behan. Raised in and around the tough north Dublin tenements, he soon established a reputation for his quick wit, his love of street stories and ballads and his capacity for prolific amounts of alcohol. He left school at the early age of fourteen to start an apprenticeship as a house painter. Much of his formative years were spent in and out of prison both in Ireland and in England, and these experiences provided inspiration for his literary abilities. Although he wrote many fine short essays and newspaper columns, he is best known for his world rated plays 'The Hostage' and the autobiographical 'Borstal Boy', which were received with great acclaim not only in Dublin, but also on Broadway and the West End of London. Known in Dublin as 'the plague of the cities barmen', he was a familiar figure in the literary pubs and drinking houses and was as much noted for his singing, boozing and brawling as he was for his writing. Despite his tempestuous personality and deep decline into alcoholism, his funeral on Monday 23rd March 1964 to Glasnevin Cemetery was one of the largest ever seen in Dublin, with thousands lining O'Connell Street to watch the final journey of one of Dublin's most colourful and best loved characters.